I joined Space Matrix in 2017 as the Global Head of Marketing, working with the CEO to build up our digital marketing platform and PR profile across APAC. I am super passionate about building brands, thought leadership, corporate innovation, communications, digital marketing, PR and supporting the startup ecosystem I am a third generation Singaporean and earned my BBA hons from the National University of Singapore. I then moved to Pakistan to work with Citibank in their Strategy and Marketing teams. In 1998 I moved to London to pursue my MBA from the London Business School and after a few years working in the Investment Banking arm at CSFB, left the corporate world and worked in the non-profit and entrepreneurial space. 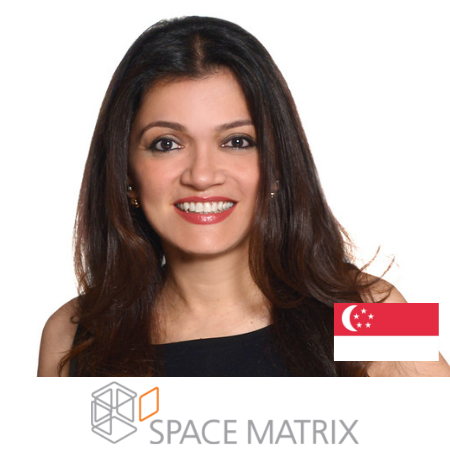 Prior to joining Space Matrix, I headed the Corporate Innovation and Business Development team at The Hub Singapore. As part of their senior management team, I was responsible for growing the Hub through corporate innovation programs, strategic partnerships and public relations programs. I have always been passionate about developing opportunities for the youth and worked on projects for the Great Ormond Street Children’s Hospital, mentored for the Prince’s Trust and worked on several scholarships for the underprivileged youth in Pakistan. I currently mentor for UN Women and lead the UWCSEA parent committee to raise funds for building schools in Pakistan with The Citizens Foundation.